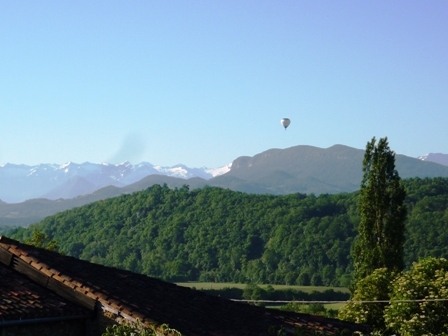 When you have a house in southern France, it tends to fill up in the summers and most holidays with lots of friends and relatives, which is why we are always grateful that we live in the entertainment park that is the Pyrénées. Here our guests, whatever their ages or inclinations, are spoiled for choice when it comes to deciding how to spend their days. Our guests this summer have ranged in ages from babies to septuagenarians and all have been persuaded to venture into the mountains either for some serious walking or biking or simply to picnic or splash around in the mountain rivers. 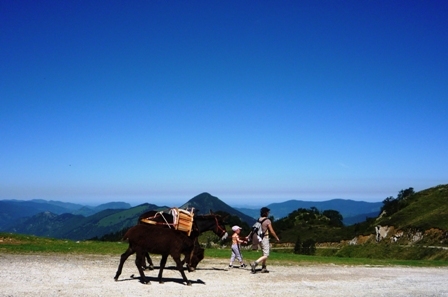 For little ones who can’t walk too far, there is the option to borrow a donkey for a few hours to take the strain- or even just the picnic – and for those looking for adventure, there is the chance to try their hand at kayaking or canyoning or to hike right over the Pyrénées and into Spain either on foot or on horseback. At Superbagnères, the ski resort above Bagnères de Luchon, the telecabine opens in July and August, fitted with special carriers so you can take your bike up to the top of the mountain and then cycle around the trails at the top before making your way back down. Bikes and push scooters are available to hire as is almost any type of mountain equipment you can think of or you can just take the lift to the top to admire the scenery. And on most sunny mornings in summer we open our shutters to the sight of the local hot air balloon taking visitors up and down the valleys for a wonderful bird’s eye view of the Pyrénées. If all that sounds far too active, there is nothing nicer than sitting on one of the café terraces dotted around the towns and villages here and admiring the mountains from afar whilst enjoying the benefit of the wonderful produce that the region provides in abundance. If we didn’t live here, this is certainly where we would choose to spend our holidays!